Library BEAR > Food & Agriculture > 2. 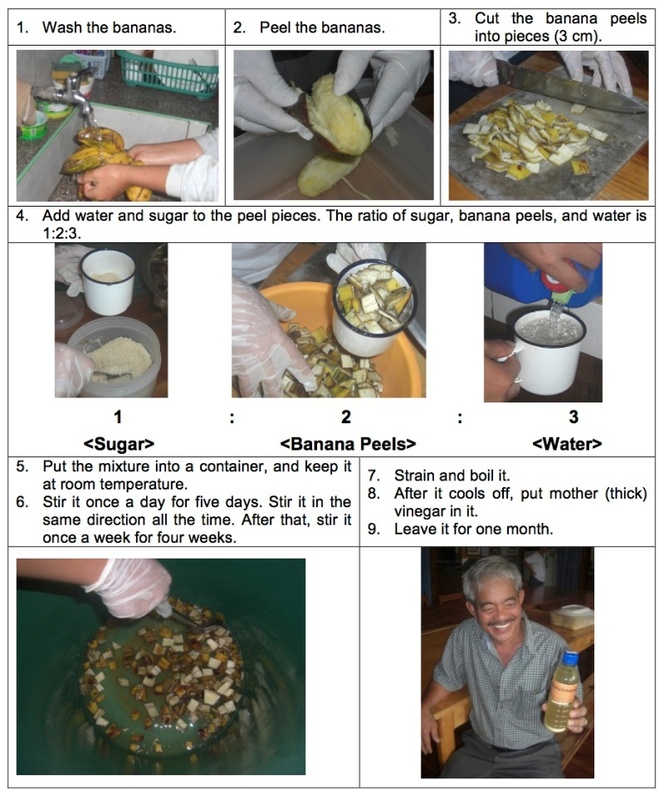 Don’t Throw Away Banana Peels! 2. Don’t Throw Away Banana Peels! Mr. Abraham Akilit, who used to work for the National Irrigation Administration (NIA) of the Philippines, started organic farming and agro-processing at home after his retirement. He constructed a small processing facility and purchased the machinery and equipment he needed with the money that he had saved for the purpose of doing something good for the environment after his retirement. The banana is one of the most common agricultural products in the world. People process bananas into chips, juice, wine, etc. When they make banana chips, juice or wine, they use the fruit part only and throw away the peels. 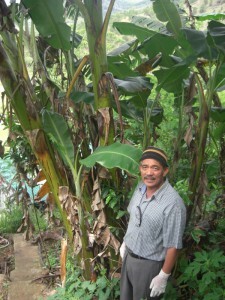 But this man processes the peels of bananas, not the fruit part inside. What does he produce with banana peels? Let’s see how he adds value to those peels! 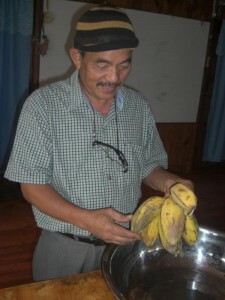 He sells bottled banana peel vinegar at the organic product shop that the cooperative owns. He sells it there since he is a member of the cooperative. Besides the cooperative shop, he has the vinegar on consignment in big supermarkets and shopping malls in three major cities, Manila, Baguio, and La Trinidad. Recently, organic products are really booming in the Philippines because more and more people are becoming health-conscious, which is boosting his organic agribusiness.